The SASD MPS curriculum provides experience in design thinking, leadership, and collaborative problem solving. In developing solutions, we consider innovation and change, organization and human resources, and suppliers, distributors, and markets. The business courses develop management skills in six specific areas: Leadership, Marketing, Operations, Finance, Legal, and Strategy. This introductory course to the graduate program in Design Management defines the 6-Step Design Thinking process to achieve innovative solutions that address the Triple Bottom Line: Profitability, Social Responsibility, and Environmental Sustainability. The course covers the variety of approaches, tools, and methods used in Design Thinking’s individual processes. DM-I also describes the six core business principles of the MPS program: Leadership, Marketing, Operations, Finance, Legal, and Strategy. DSNMG 410 is a service course open to any UB graduate student in good academic standing. Students work in interdisciplinary teams with one client each semester. Empathy for the client and the client’s multiple constituencies lead to direct research of human needs and recognition of one’s own inherent beliefs. The course emphasizes team collaboration, leadership, and personal presentation skills. This business course satisfies the MPS requirement for a course in Leadership This course enables students to explore individual and group behavior in organizations and the contextual factors that impact workforce performance and organizational effectiveness. An understanding of topics including organizational culture and structure, ethics and corporate social responsibility, team dynamics, leadership, decision making, and motivation is emphasized. Special projects give students the opportunity to explore specifics of design thinking in the context of their own area of design expertise or interest. Students are encouraged to seek out opportunities to gain practical experience in the design and design management fields. The course content is individually developed in consultation with the MPS program Chair and may include design coursework or independent research on a specific aspect of design or design management. Design Management has three core principles, the “Triple Bottom Line,” that must be in balance for an optimal solution: Profitability, Social Responsibility, and Environmental Sustainability. Sustainability is examined in this course through readings and guest lecturers, each of whom has required readings. Building on the foundation formed in Collaborative Design Studio I, students will again be grouped in interdisciplinary teams to complete an innovative, client-based project. An emphasis is placed on financial profitability and sustainability in the context of the Triple Bottom Line. Profitability is taken for granted in any business solution, but Design Management must balance profitability with the two other core principles, Social Responsibility and Environmental Sustainability. With this understanding, Profitability may also be called Financial Sustainability. Through relevant readings and lectures, students will develop an understanding of what Profitability can be and how to introduce this enlightened meaning to the leadership of an organization. In addition, DM-III students will develop and submit a thesis proposal for approval. This business course satisfies the MPS requirement for a course in Marketing This course serves as a graduate introduction to the theory and practice of both management and marketing, two separate, yet related, fields of business study. The management portion of the course will address the four key tenets of management: planning, organizing, leading and controlling. The marketing portion of the course will address creating, delivering, and communicating value by building customer relationships via the marketing mix: product, price, place (distribution), and promotion. This business course satisfies the MPS requirement for a course in Operations This course focuses on the managerial aspects of how to effectively manage, plan, and execute programs and projects with a focus on high quality deliverables: arriving on time, within budget, within scope, and to the customer’s satisfaction. Areas covered will include program and project management life cycle phases, portfolio investment management selection and prioritization, scope and project charters, planning, development, estimating, staffing, leadership, scheduling, risk management, project metrics, and vendor integration. This course addresses research methods in preparation of a thesis proposal and the thesis itself. Strategy7,m an action plan to achieve a goal, is a significant aspect of the implementation of Design Thinking. Through relevant readings and lectures, students will develop methods of Research and understand the importance of Strategy in realizing the Triple Bottom Line. In addition, DM-III students will develop and submit a thesis proposal for approval. Collaborative Design Studio III continues to equip students with the skills they need to work with cross-specialist teams on real world, client-based assignments. Students will focus on ways to collaborate, develop a culture of innovation, and be a motivating leader. The projects for this course will focus on the Triple Bottom Line: Profitability, Social Responsibility, and Environmental Sustainability. This business course satisfies the MPS requirement for a course in Finance This course is a graduate introduction to the study of economics and finance, two interrelated and integral fields in the study of business. This course develops the foundation in understanding how the real economy works, and how finance connects the real economy to the monetary system via the financial system. Topics include financial statements, time value of money, the financial markets, and how firms make capital budgeting decisions. This business course satisfies the MPS requirement for a course in Legal An introduction to Accounting, and the Legal Environment of Business and Ethics. The course focuses on the fundamentals of accounting and how the legal environment of business impacts business decisions. Emphasis on the understanding of how financial statements are prepared, and how they are used as a basis for decision making by business owners, investors, creditors, government and others interested in the financial condition of an economic entity and the results of its operations. The Law component introduces how the legal environment of business impacts business decisions with broad ethical, and critical thinking examples throughout. Fairfield County and the surrounding tri-state area are rich in organizations in need of qualified design management interns. Through strategic partnerships and student initiative, internships will be established to give students first-hand experience as design managers. Students will report on their experience and that report, coupled with his or her manager’s evaluation, will form the basis for determining the student’s grade. Internships are taken by domestic students; Co-ops are taken by international students. This course requires students, working independently or in small teams, to research and write about an idea that explores and addresses the Triple Bottom Line. Theses must discuss Innovation, Profitability, Social Responsibility, Sustainability, Marketing, Leadership, Finance, Legal, Operations, and Strategy. This challenge demands that the student demonstrates an understanding and mastery of all ten topics covered in the program while expressing their own sensibilities based on their experience, culture, and design discipline. Collaborative Design Studio IV places fourth-semester students in leadership positions on the collaborative teams, working with their team and with the other team leaders. Specific attention is given to the culture of innovation and the barriers to implementation. In this position, students can experience the challenges of solving personnel problems as they inevitably arise. Students also serve as contacts with the client, ensuring a smooth process for them and handling every aspect of the mid-semester and final presentations. This business course satisfies the MPS requirement for a course in Strategy The objectives of this course are to understand and apply concepts and techniques of product commercialization. The course focuses on taking student-created product concepts and having student teams drive the concepts to become actual products. Product design, prototype creation, market analysis, and financial analysis all come together with the student team to create a viable product. If ideas are worthy, teams may work with the University’s CTech IncUBator to actually commercialize their products. Fairfield County and the surrounding tri-state area are rich in organizations in need of qualified design management interns. Through strategic partnerships and student initiative, internships will be established to give students first-hand experience as a design manager. Students will report on their experience and that report, coupled with his or her manager’s evaluation, will form the basis for determining the student’s grade. Internships are taken by domestic students; Co-ops are taken by international students. Are any MPS DM courses online? No, none of the MPS courses are taught online. Two of the most important aspects of the program are leadership and collaboration, neither of which can be fully explored and experienced in an online course. 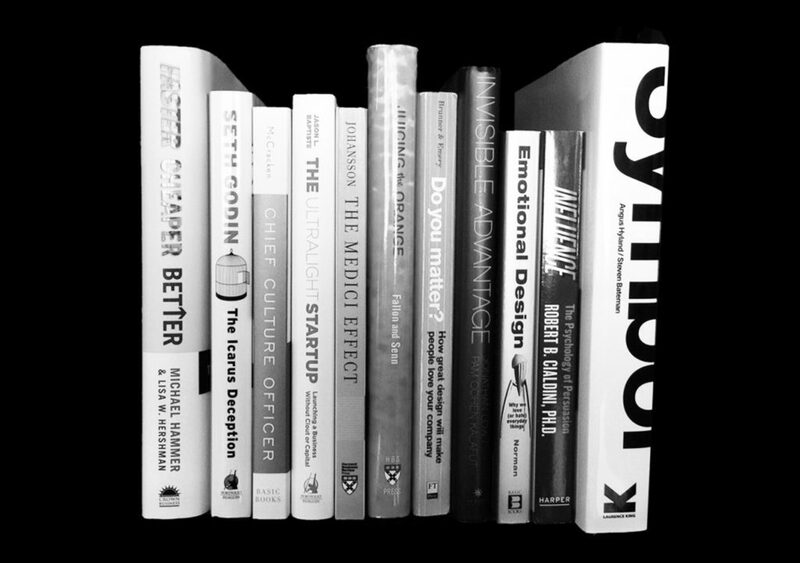 You will typically read one book per semester for the Collaborative Design Studio and up to ten books (or significant other readings) per semester for the Design Management course. The books in the DM course are chosen by the visiting lecturers, so every semester has a different group of selections. Shown here are a some recently assigned books. Will I write a thesis? Demonstrate mastery in the 6-Step Design Thinking process. Apply research to support problem solving and creativity. Illustrate expertise in collaboration, leadership, oral and written communication. Show familiarity with and apply foundational business terminology, practices, and concepts. Create professional reports and presentations integrating design, innovation, technology, and management.